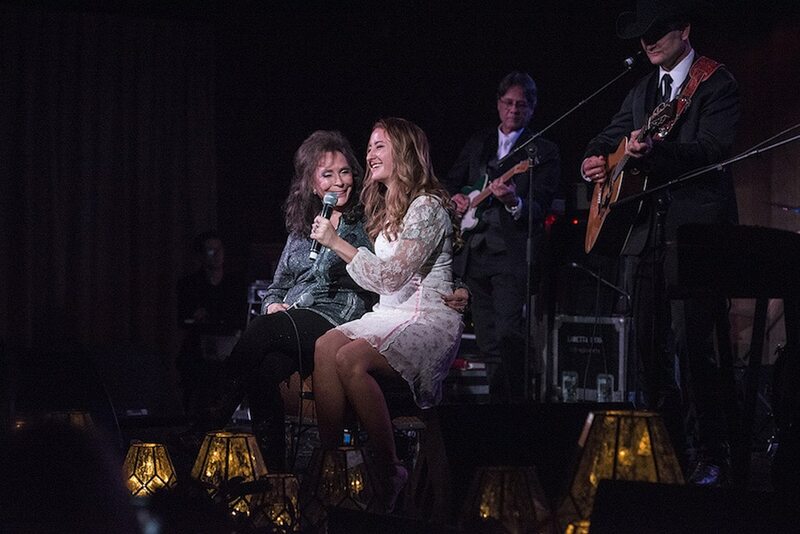 Margo Price, the Milk Carton Kids and Loretta Lynn were the featured artists for the 7th annual celebration, hosted by and benefitting the Americana Association. Life on a farm is all about the cyclical nature of things – seeding and germinating, hatching and growing, feeding one with the fruits of another. This past weekend at the Americana Spring Celebration at Blackberry Farm, a luxury resort in the Great Smoky Mountains, we were reminded how the best music is cyclical too: and that the greatest, most organic work comes straight from the soil. Margo Price, the Milk Carton Kids and Loretta Lynn were the featured artists for the 7th annual celebration, hosted by and benefitting the Americana Association. Though the organization’s fall festival and conference in Nashville is their best-known event, these three days help make all of those dive bar moments and artist discoveries possible. Independent support for the arts has always been a crucially important thing here in America, and it’s arguably more so under our current administration: with Trump threatening to gut the likes of the National Endowment for the Arts, seeing a beautiful room full of patrons willing to hand over checkbooks in the name of music is a welcome, vital sight. Don’t be mistaken: this is a luxury event. Champagne is swilled, pre-concert meals are multi-course affairs where jackets are required and auction items, like a guitar signed by Lynn, Price and the Milk Carton Kids, fetched five figures, with the bidding done over cookies and cocktails. Blackberry Farm, perched in the Smokies, is like a pristine mountain dream: guests tool around in golf carts from massages to horseback lessons, with a water bottle or plate of fresh-picked vegetables never far away. But it’s still a working farm, where enjoying the fruits of its bounty is part of the experience – the focus not on shipping in exotic fruits, but cheese and beer, for example, made right on the grounds. Its guests appreciate the finer things in life, but they also appreciate what is organically grown. And that applies to music, too. Blackberry Farm’s commitment to the arts doesn’t just end with the yearly Americana Spring Celebration, either – they’ve hosted major country stars like Lady Antebellum in the past, and this summer and fall will feature events with the likes of Drew Holcomb, Emmylou Harris and friends, Brothers Osborne, Little Big Town and even a special Billy Reid Shindig. For a music lover who also wants to blend some luxury into their listening experience, it probably doesn’t get much better: the resort grounds are majestic and breathtaking, and the settings allow guests to feel like they are seeing artists as closely and intimately in their own living room or local bar. If their local bar served rare Pinots and foie gras, that is. Suffice it to say, it’s a very different place from where Price may have been playing two or three years ago, before her debut solo album Midwest Farmer’s Daughter was released. Kicking off the weekend in Blackberry Farm’s Bramble Hall, Price played songs off her LP along with covers (like Kris Kristofferson’s “Me and Bobby McGee,” which she is tailor-made for) alongside her band with the dynamism and vigor she would bring to any club, be it a sold-out theater or dive bar like the old days. Price was the Americana Association’s pick for Emerging Artist of the Year at their annual Honors and Awards in 2016: the AMA was one of few places smart enough to recognize Price’s enormous talents, while Grammy and the CMAs fell silent. Price doesn’t feel “emerging” anymore, though, and this fall, hundreds of up-and-coming artists will showcase at AmericanaFest, hoping to follow in her footsteps: and it feels peacefully cyclical that her contribution at this benefit will help to make that possible. On night two, it was the Milk Carton Kids’ turn: changing the setting to Blackberry Farm’s fine dining room, the Barn, Kenneth Pattengale and Joey Ryan blended their own tracks (with, unusually for the twosome, a fiddle player and upright bassist) with a selection of Felice and Boudleaux Bryant songs, ones originally preformed by the Everly Brothers and the Osborne Brothers: like “Wake Up Little Susie,” “Love Hurts” and “Rocky Top,” with a little help from Ricky Skaggs and Sharon White along the way. The Milk Carton Kids made sure to blend their trademark deadpan humor with their expert musicianship, cracking quips along the way (“you are a well-dressed Wikipedia page,” Pattengale jabbed to Ryan after he shared some facts about the Bryants). Back to back with Price, it showed just how much breadth there is in the Americana landscape: they couldn’t be more different, but, as association President Jed Hilly and Blackberry Farm proprietor Mary Celeste Beall pointed out, both artists celebrate focusing on honesty free from commercial dependency – though Pattengale would joke, before starting their set, that “we are actually completely commercially motivated.” Of course it only takes a few bars of a song like the exquisite “Michigan” to prove that wrong. On night three, it was all about Lynn: her past, her future, her present. And ours, too. Back in Bramble Hall, two of her daughters and granddaughter Emmy Rose – only eighteen years old – warmed things up. Lynn, who was just saluted by the Americana Association in Los Angeles, warned that her throat was shot from the night before, but songs like “You Ain’t Woman Enough (To Take My Man),” Don’t Come Home A-Drinkin’,” “One’s On the Way” and “When the Tingle Becomes a Chill” still showed her unparalleled voice, and a perspective that changed everything for women (and men) in country music, to this day. But perhaps the evening’s best moment – and one that took the event full circle (pun intended, as it’s the name of Lynn’s most recent album) – is when Price, the Midwest Farmer’s Daughter, joined the Coal Miner’s Daughter for, naturally, “Coal Miner’s Daughter.” Price has appropriately been compared to Lynn, but the similarities run deeper than just their tone or gender: like Lynn, Price doesn’t worry about playing it safe or pleasing the masses. She writes from her gut, something that Lynn did her whole career – it even had her songs banned from radio on numerous occasions. So seeing the two women onstage, at an event expressly aimed at raising money to help furnish the future of Americana, felt like a certain kind of baton passing in the purest sense. The storms may rage, but, in the end, the garden keeps growing, and the music plays on.